I well remember losing feeling in one part or another. Nowadays that can happen while lying in bed. Quel dommage, absolutement! 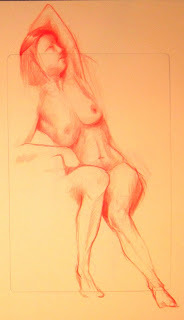 Please tell Etienne his life drawings grow plus tres belle with each sitting he attends. Sometimes it's good to be away a little while. hi steve,[and little frog whose name i can never remember how to spell...so sorry dapper froggy-i saw your relative today, a baby king snake whose tail tip, alas, was caught in the tractor's scoop and off with it! as i said...alas..but he was fine and so little, a baby one and exciting to think maybe....] and now do i need to learn french???? What I will say is how impressed I am with these figure drawings. 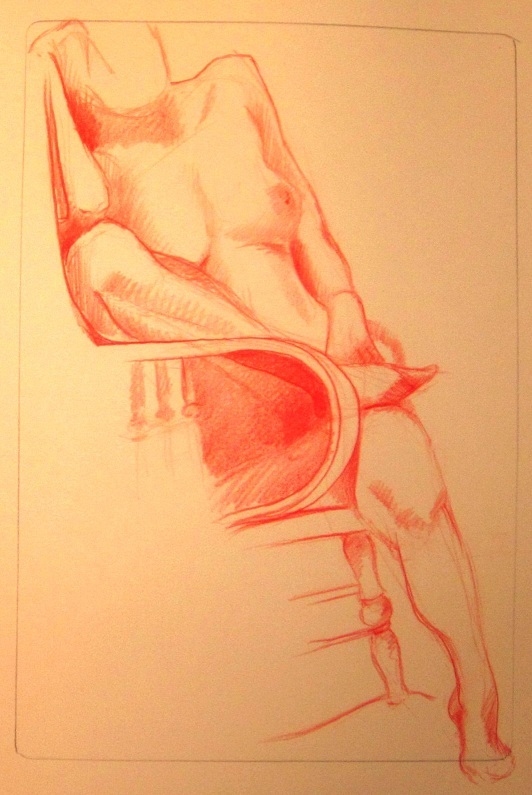 I especially love the one in which the parts of the chair are included. I can't imagine sitting in a hard wooden chair for that long with no clothes on but I very much appreciate the results. Please let Etienne know I came by. 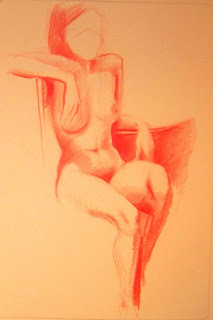 How wonderful that Etienne was home to attend a life drawing class! It's been too long. I especially like the red pencil for these poses.